Next Sunday, 13th October, the first of the three special events to celebrate the completion of the restoration of the historic Hill organ in St Fin Barre’s Cathedral takes place. On the second Sunday in October each year, the cathedral congregation celebrates Harvest Thanksgiving at all services. 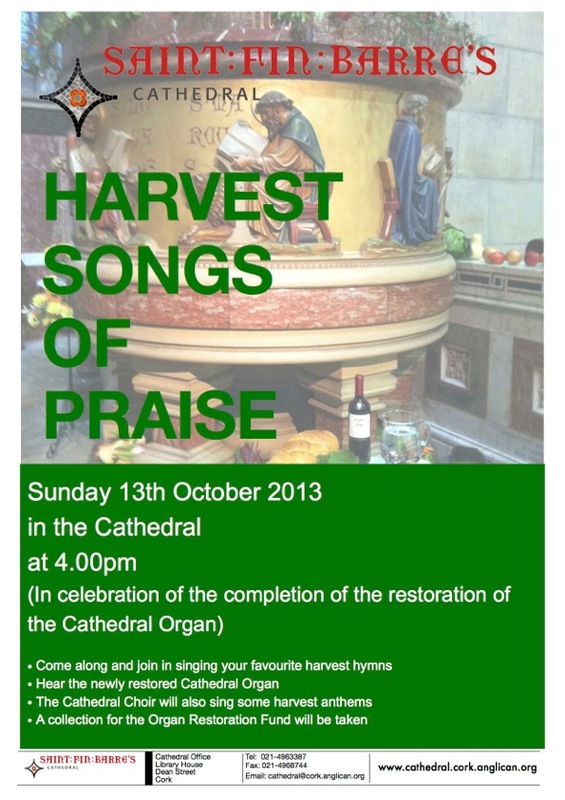 This year, the evening service has been moved to 4.00pm when a special Harvest Songs of Praise will be held. All are welcome! This is a unique opportunity for all to come along and join in the singing of many of their favourite harvest hymns such as ‘We Plough the Fields and Scatter’, All Things Bright and Beautiful, Come ye Thankful People Come, and many others. The cathedral choir will also sing three harvest thanksgiving anthems. All are welcome – this being an act of worship, there is of course no charge. A collection will be taken for the organ restoration fund during the service. This entry was posted in Cathedral, Church Services, Cork. Bookmark the permalink.